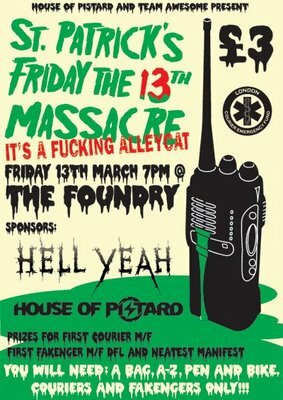 House of Pistard and Team Awesome are organsing an alleycat next week so get your arse down to The Foundry for 7pm and race. I’m giving them some shirts and there will be prizes from H.O.P. and Hell Yeah for the first male and female courier and non couriers. Sam, if you are reading this, please can I have my A-Z back? Ta muchly. sure you don’t want my one we used last time with the pages missing? !